Prayer beads are just for Catholics, right? That’s what I used to think before reading “Bead One, Pray Two: A Guide to Making and Using Prayer Beads” by Kimberly Winston. Thanks to Winston’s book my ignorance on this topic has been completely exposed and I now know that plenty of non-Catholics use prayer beads. Tune into this episode of CraftSanity to hear Winston, 44, of chat about her enlightening book that traces the history of prayer beads and their use as part of many religious traditions. Drawing on her background as an award-winning religion writer, Winston weaves historical information together with a collection of prayers and instructions for making your own prayer beads. Even if you’re not a big religion junkie, there’s still something in this podcast for you if you believe the act of making art and craft is in some way a spiritual experience. So grab your beads and settle in for a nice long chat. 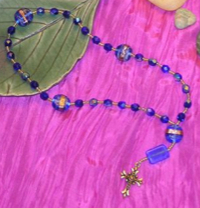 Enter to win “Bead One, Pray Too.” Post a comment below about what prayer beads mean to you, or share a story about a set of beads you inherited or made. Simply weigh in on the discussion to enter to win the random drawing for a copy of “Bead One, Pray Too.” The deadline is Saturday, July 19, 2008. Good luck! A specials thanks to both our sponsors! This episode of CraftSanity was sponsored by Patricia Zapata, the independent designer and artist who runs Alittlehut.com featuring handmade paper illustrations and templates, Zapatadesign.com and Craftysynergy.com, a blog of short artist interviews. And thanks to sponsors David and Tina Lindquist. David is a wood turner who makes pens, oil lamps, knitting needles, nosteppines (for yarn ball winding) small bud vases and bowls. Check out David’s work at craftiness.etsy.com and Tina’s blog at Tinascraftiness.blogspot.com. Want to promote your craft business? Visit the sponsors section if you’re interested in sponsoring an upcoming CraftSanity episode. OH MY GOODNESS! I never knew calligraphy could be so popular!